I thought The Host was quite interesting but it did remind me a lot of Twilight. With the love-triangle and wanting to be good. 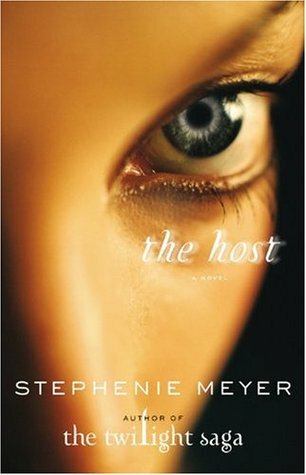 I gave The Host by Stephenie Meyer three out of five stars. I enjoyed the novel, but it was pretty similar as Twilight and mostly in the bad ways. I enjoyed the world. The aliens are interesting and I liked the fact that for once they were not just trying to kill the humans, but infiltrated them to live a peaceful life. Wanda is part of the evil and she is also the main character together with Melanie. I thought Wanda was more interesting because she is the alien and so sort of different from the normal thing. But I did not like the whole love triangle between Melanie’s body and Jared and Ian. It was weird even more so than Twilight, with Wanda wanting Ian and Melanie wanting Jared. At some point it just got confusing. The Seeker, who was the bigger evil in this story, was not even interesting. She felt to me just like a big bully trying to get her way. I did not like her at all. Ik had no problem with most of the story. The end was a bit sappy, but whatever. Just the love triangle just stupid. And The Seeker was a waste of space in my eyes. Back in 2013 The Host was released as a movie. It starred Saoirse Ronan, Diane Kruger, Max Irons and William Hurt. I think the movie was okay, but just like the novel it could have been so much better. I can’t remember ever liking it, but I do remember it was better than Twilight. This entry was posted in Book Review and tagged Book Review, Drama, Movie, Romance, Science-Fiction, Stephenie Meyer. Bookmark the permalink.